While kitties have the natural ability to select and combine different food types to meet their daily nutritional needs, not all their choices are in their best interest! ;) Forgoing free feeding and establishing two meal times a day helps you customize your kitties’ calories to match his lifestyle :)Fussy Feline? In her article, “How to Feed Your Cat What She Wants—and Needs”, Dr. Becker breaks down a study on cats and their nutritional needs, and how we can help fulfill them with our choices of foods for them. The study experimented with allowing the cats to pick and choose a variety of food types and protein, fat and carbohydrate ratios. The results of the study concluded that cats have an innate ability to choose foods that meet their changing dietary needs on a daily basis. This is in line with the idea that rotating protein sources and food types is a great idea to help your kitty get all the nutrients she needs! 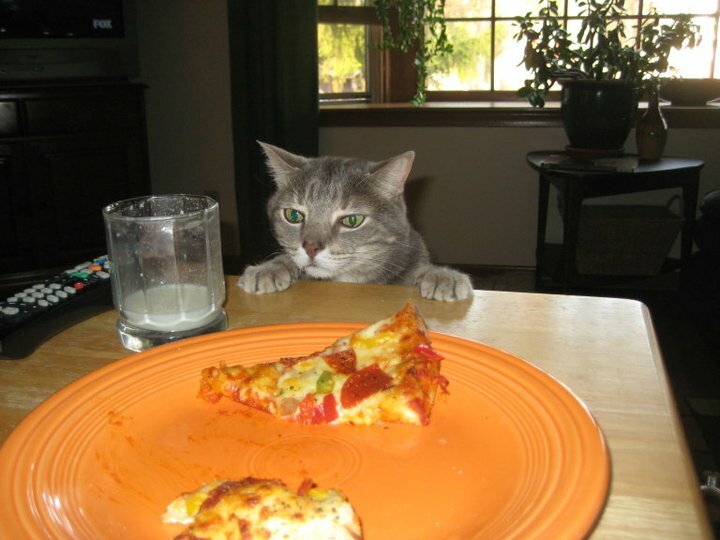 So if your feline seems fussy more often than not, she may benefit from diet rotation. Click on Cylone’s photo to see his Petfinder.com profile!Cyclone from HAWS is featured here this week. My name is Cyclone—and maybe I think I should act like one—but I have a lot of potential! 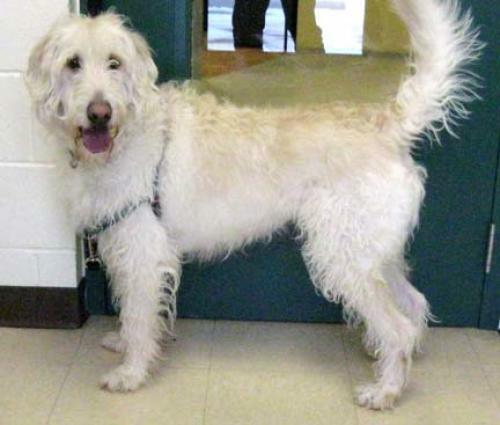 I am a 4 yr old male Golden Retriever/Poodle mix that has a lot of energy and will need a special home. I am NOT the dog for a first time dog owner and I am NOT the calm dog that you might imagine a Golden/Poodle mix should be. I am not fond of cats, and other dogs just get me upset; older teens might be fine as long as my new family has owned large, active dogs in the past and realizes the amount of training I will need (I need a lot of activities that will keep my body AND mind busy!). You will need to meet with a trainer before you take me home so you can learn how to continue what HAWS has started….my school lessons!!! I am cute as can be, and ready for a firm, active owner who will help me be a great doggie! Train your Best Friend @ HAWS who offers classes for puppies through adults. HAWS dogs get a special discount but all dogs are welcome. Call 262-542-8851 ex 114 or email training@hawspets.org. Adoptable dogs and cats will be at the Mukwonago store Friday & Saturday April 12th & 13th from 11am-3pm and again on Friday, April 26th from 11am-3pm. Stop in to see if your fur-ever friend is here waiting for you! Have you visited the Facebook page of our friends at the Dog Exercise Area at Mukwonago Park? Earlier this week they posted that Waukesha County has moved the date to raise the $25,000 to August 1st of this year. If the money is raised by this time then they will start work on the area in September/October. Don’t forget an easy way to raise money for the dog park is to ask your friends and family to Like End of the Leash’s page on Facebook! For every new like we get over 1851, we will donate $1 towards the dog park—up to $500! You’ve already raised $90 that will be donated…thank you! There is also a special fundraiser planned for May. Please visit the Dog Exercise Area at Mukwonago Park’s Facebook page for upcoming details! Dr. Deanna Witte with Witte’s Natural Veterinary Care will be at the Mukwonago store twice a month to do consultations and/or spinal manipulations for your pet. She comes the 2nd and 4th Thursdays. Dr. Witte’s next visit will be Thursday, March 28th. You can also make an appointment for a consultation with Dr. Witte to discuss holistic options for your pet (nutrition, supplements, essential oils etc…). Appointments are for 20 minutes and include a consultation and adjustment. Call the store to reserve your spot: 262-363-3338. Nature’s Variety Instinct Dry Kibble for dogs: $5 off the small bag, $7 off the mid-size, and $9 off the large. Cat food is $5 off! Select Wellness Foods (mostly Wellness Simple food) are on a close-out sale in our Mukwonago store! Specially marked bags range from $11.00 to $48.00!!! While supplies last only, so stop in soon for yours. Food for Thought...and for Health!